We arrived In the capital Ulaanbaatar from Russia tired and in need of a shower! We were met by our Honcho Tsolomon, who took us directly to the hotel where we had twin rooms a shower and was clean. The first thing we noted about UB, as it is know, is that it is much more Westerner friendly than Moscow but the traffic is horrendous there seems to be no laws just drive and hope! We had a bit of a rest and a shower and then headed out to lunch, Chinese, which was nice and only about 3 pound each. 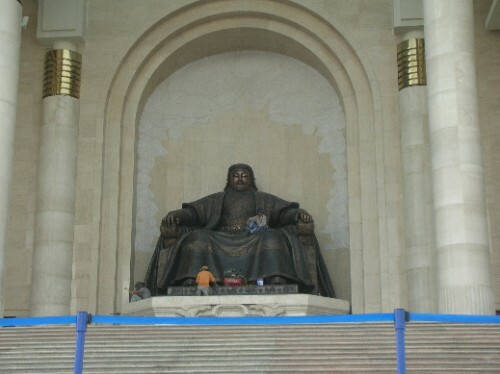 We then headed to Suhkbaatar square where we had a wander around, there is a statue of Sukhbaatar on his horse and at the far side of the square there is a government building with a massive statue of Ghengis Khan in front. In the square there are also some traditional Mongolian dwellings Ger's (Yurt). These are round felt tents and the ones that we saw had beautiful carvings on the wooden trellis. We then walked over the road to the Museum of Mongolian History, which was fab it had loads of artefacts including examples of traditional dress. I could have walked along for hours, but time was quite short. We then headed out of the town about 5 mins and ended up at the War Memorial which was at the top of a lot of steps! Just as we reached the top the heavens opened and we were in the middle of a thunderstorm. On the drive back down we also saw the statue of the Golden Buddah, but because of the rain it was a fleeting glance. As it was Ben's birthday today we decided that we would have a night on the town the Lonely Planet guide said that there was only one nightclub so that was where we were heading. As we ventured to our first bar there was a powercut, a common occurance it seems. However we managed to get a drink the girls opting for red wine, it was served chilled and was sweet we think it was port, we drunk it. We then headed for a quick bite to eat, once we'd finished our T-bone we headed to an Irish bar we had seen on the way in as everything was closing - when we got there so was this so we went with some Sweedish guys to a Mongolian lap dancing club - Polo! We were only there a minute when there was another powercut. We played a game of play your pants right in the dark and as soon as it was my turn the lights came back on - electric pants! We played pool and watched a military lap dance show.